It's the fastest-growing, coolest Linux distribution out there, and now you can join the excitement with this information-packed guide. Want to edit graphics? Create a spreadsheet? Manage groups? Set up an NFS server? You'll learn it all and more with the expert guidance, tips, and techniques in this first-ever soup-to-nuts book on Ubuntu. From the basics for newcomers to enterprise management for system administrators, it's what you need to succeed with Ubuntu. You can download it from Rapid Share. VnTutor do not own or host this book. So, VnTutor don't guarantee that these links are active forever. 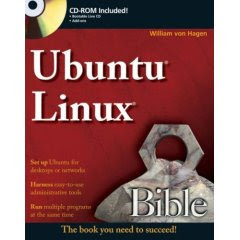 You can download other Ubuntu Linux books here. It's free. In this lesson, you will be introduced about the Gnome desktop of Ubuntu Linux in the live Ubuntu CD. After you finish this lesson, you can know about the history of Ubuntu Linux and who behind it. In Ubuntu Linux, the background color does not need to be a static color. That means you can write a script to change it automatically each a period of time. In this script, you can see that the background color will be changed each 10 seconds. I have set parameters for colors to change the background color from dark to light each round. If you want to see effect immediately, you can set this value to 1/2 (haft second). You can set other values to variables $R, $G, $B to have other effects. Please share your results with everybody here. An introduction about Linux and Free Software. Watch the first Video Lesson. I want to know what is the top 10 of Ubuntu-based Linux Distributions shown in the following list. Any ideas for this question? Do we have a site to vote for them? Xubuntu is an official derivative of the Ubuntu open source operating system, using the Xfce desktop environment. Xubuntu is intended for use on less-powerful computers or those who seek a highly efficient desktop environment on faster systems, and uses mostly GTK+ applications. This is Scibuntu, Ubuntu Linux for scientists and science students. Scibuntu is not just another Linux distribution. 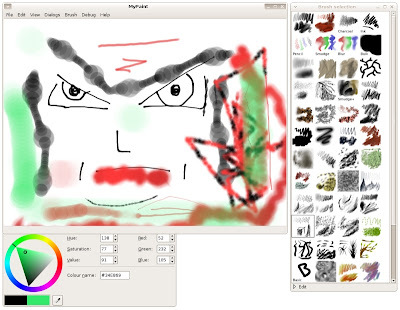 It is a script that adds scientific programs and other convinient tools to the plain desktop Ubuntu. Linux Mint’s purpose is to produce an elegant, up to date and comfortable GNU/Linux desktop based on Ubuntu. Guadalinex is a Debian based distribution for the Andalusia area of Spain. Ubuntu-based Guadalinex 2005 was released October 2005. Version 3.0.1 was released June 16, 2006. MoLinux is a distribution developed by the regional government of Castilla la Mancha in Spain for use in the region’s government offices and schools. Early version were based on Debian, and later Progeny. Version 1.2 “Dulcinea”, released June 16, 2005 is Ubuntu-based. Version 2.0 (Sancho) was released December 18, 2005. A live CD version of 2.0 was released February 10, 2006. MoLinux 2.2 (Rocinante) Live, based on Ubuntu Dapper 6.06.1, was released October 3, 2006. The idea of Ubuntu Lite is to bring the power of Ubuntu across to the users of Legacy systems. So not just to make a small linux as this has been done before (Puppy Linux, Damn Small linux, the Rule Project). Nor to make a useable linux based desktop Operating system (that has been done with Ubuntu Linux, Beatrix) The idea is to bring the power of ubuntu to the typical users of Legacy hardware (ie the grandma who gets an old P2 set up for her but does not know how to use it). EduPuppy GioveLUG is a Linux distribution developed by GioveLUG of Terracina, Italy. Its main purpose is to provide a free and intuitive operating system for children - with a good collection of educational tools and games. A GNU/Linux project, to take all the binary blobs out of a rather popular distribution and make it all free. In doing so we have also produced a set of scripts that allow anyone to create a GNU/Linux Distribution. SimplyMEPIS is a KDE-based, Debian-derived distro that focuses on desktop use. The previous stable release came out in May of 2005, but the newest version of SimplyMEPIS is scheduled for release today, and it looks like a great release for anyone who’s interested in desktop Linux. The SimplyMEPIS installer is a bit different from other installers you might be used to. Rather than using an Anaconda -like installer or a text-mode installer like Debian’s or Ubuntu’s, you install SimplyMEPIS using a custom MEPIS installer after you boot into a live CD environment. X-Evian is a Live-CD based on the popular Ubuntu Linux distribution, but X-Evian has Xfce as desktop environment. X-Evian is a selection and compilation which has been carefully chosen and configured for technological and social production and activist users. nUbuntu or Network Ubuntu is a project to take the existing Ubuntu distribution and remaster it as a LiveCD and Full Install with tools needed for penetration-testing servers and networks. The main idea is to keep Ubuntu’s ease of use and mix it with popular penetration testing tools. Besides usage for network and server testing, nUbuntu will be made to be a desktop distribution for advanced Linux users. zUbuntu is an unofficial derivative of Ubuntu to the IBM eServer zSeries mainframe computers by Thomas Uhl. It is currently a work in progress, as there are no releases available. Impi Linux is a South African Linux distribution based on Ubuntu, which focuses on the enterprise and government sector. mEDUXa is a Free Software GNU/Linux distribution developed for educational purposes that is part of the MEDUSA project. It will be deployed in 35,000 computers distributed in 1100 schools, which represents 325,000 possible users (25,000 teachers and 300,000 students).the Canary Islands state schools. Teachers and students will be able to use it through adual boot, accessing it by a boot loader. 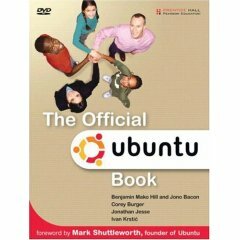 You also download other Ubuntu books here. It's free. This book is the best-selling guide to the hottest new Linux distribution. 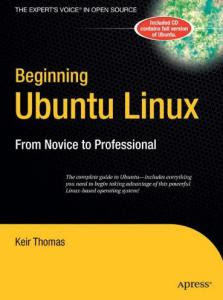 Within its 600 in-depth pages, you'll learn how to become a pro-level Linux user. The book starts by introducing you to the world of Linux. 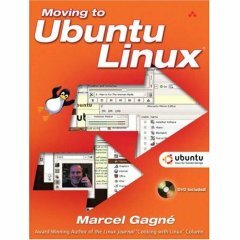 Then it outlines Ubuntu installation in illustrated steps, after which you'll learn how to configure every piece of everyday tech hardware such as your Internet connection, printers, 3D graphics cards, Bluetooth devices, and much more. Then you'll learn fun tasks such as listening to audio CDs and MP3s, watching movies, performing office tasks, and even image editing. 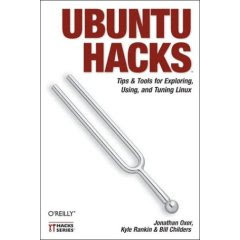 Additionally, there's a series of comprehensive tutorials on Linux internals and the command-line prompt--essential for any Linux expert--and the book includes special sections on optimization, security, and system maintenance. You can download it from RapidShare. VnTutor do not own or host this book. So, VnTutor don't guarantee that these links are active forever. In last post, you knew how to assign a sound file to login event in Ubuntu Linux. But the problem is that Ubuntu only allows the sound file in WAV format. 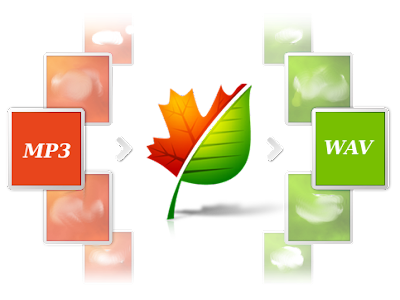 So, what is the solution in the case you want to play an audio file which is available in other formats like MP3. A proper way to solve this problem is that you need a tool which allows you to change from current format saying MP3 to WAV one. So, what is the needed tool to do that? It is Sox which is maybe available in your Ubuntu Linux. SoX is a command line program that can convert most popular audio files to most other popular audio file formats. It can optionally change the audio sample data type and apply one or more sound effects to the file during this translation. Now, you follow the following steps to know how it works. 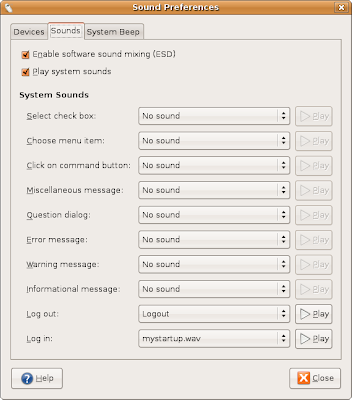 The startup music is one of the easiest items to change in Ubuntu. In this post, I will show you how to do it step-by-step. Step 4: Assign event Log in (the last item) to new music file (mystartup.wav), if you want to enjoy immediately, you can click on button Play and click Close to close the window. Most of posts collected from Ubuntu bloggers on the Net are written for new Ubuntu users. I want to collect a list of 10 links but still missing some. If you have any post on this topic, please let me know. I 'm ready to put a link to your post to the remanding part in my list. Will you finally break down and install Linux next year? The answer may surprise you.